Chicago was the starting point for a cross-country adventure that my sister just returned from. We both have a fascination with trains and last year we took our first cross-country trip on the California Zephyr from San Francisco to the halfway point in Denver. This year we decided to do the most popular route all the way from start to finish. The Empire Builder begins in Chicago and ends in either Seattle or Portland. I was excited to start a voyage like this in a real classic station. 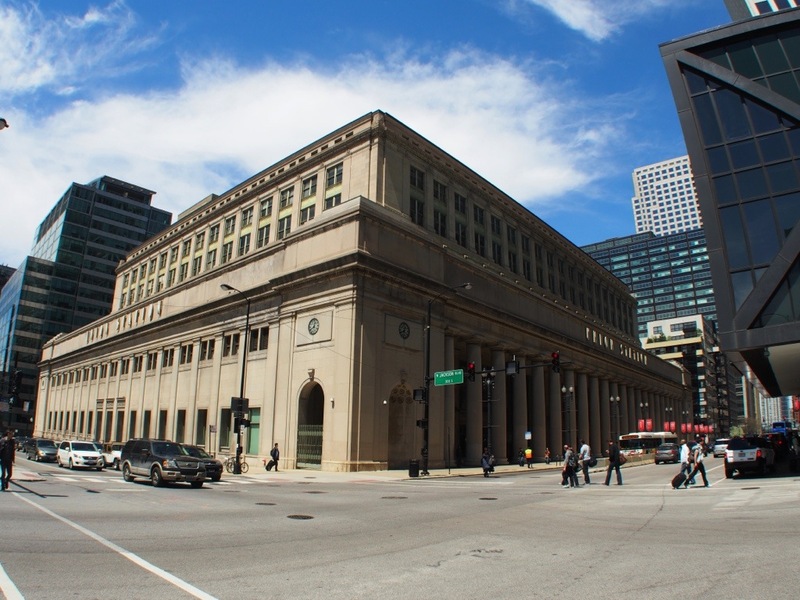 Union Station in Chicago, is one of the grandest still in operation. Work began on this massive 10 city block complex in 1913 and it was finally opened in 1925. It’s exterior is massive, but the subtle detailing hints at what you will find inside. 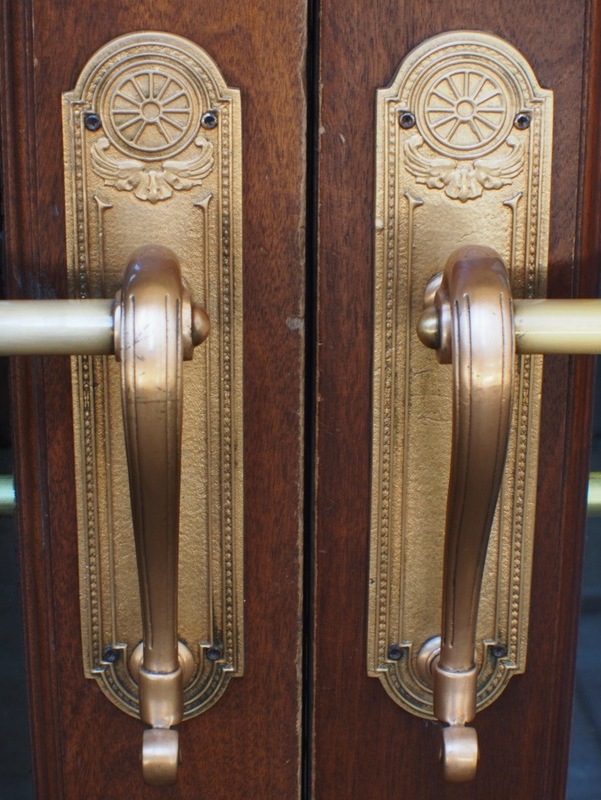 The door handles on the entries have steam era train wheels as a part of the motif. Union Station is all about the details. 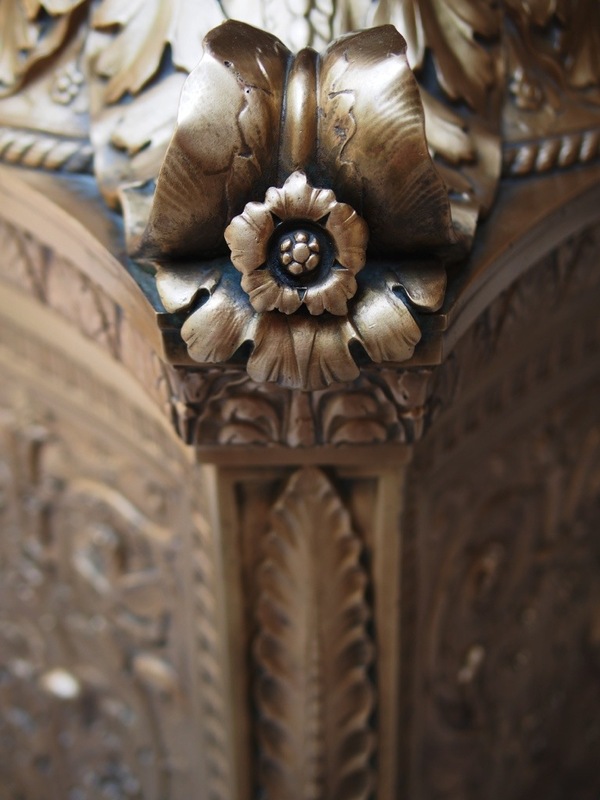 These brass flowers adorn the lamp posts on the main floor – each one is a piece of art. 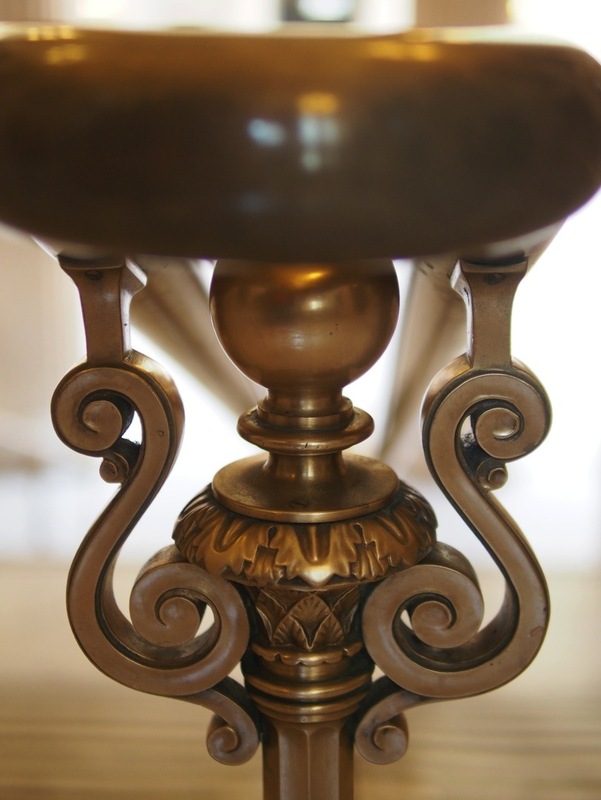 Elegant brass handrails are worn smooth with almost a century’s use. The ornate supports retain their fine detail. 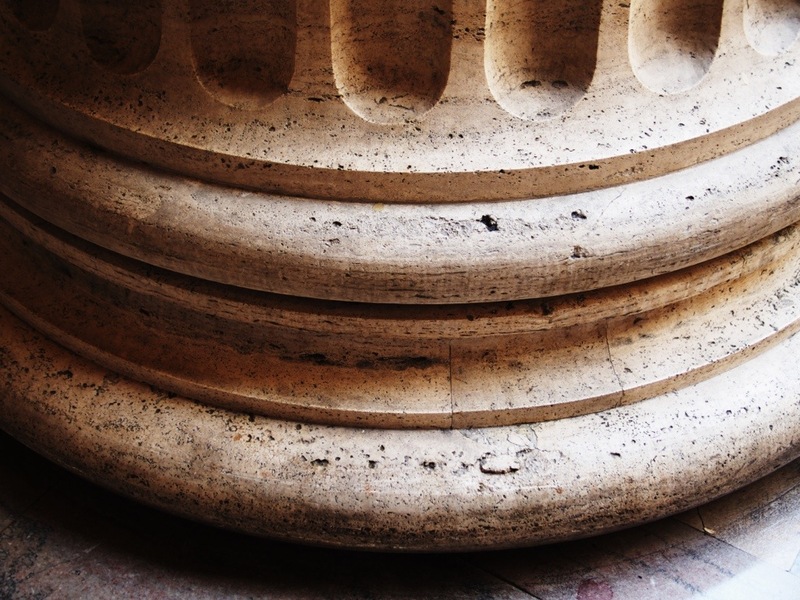 Massive Corinthian marble columns support the Grand Hall’s vaulted ceilings. 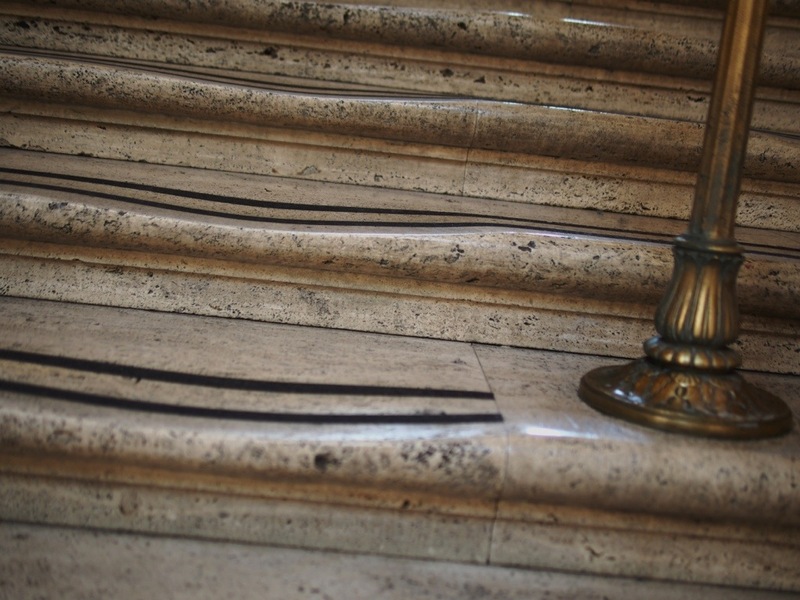 Marble Stairs worn by millions of footsteps can be treacherous today. The vaulted glass ceiling floods the floor of the Hall with natural light. This is the massive staircase that you enter onto from the street level. To All Trains – from the Great Hall floor your are now below street level and can enter the gates for boarding. As grand as the Grand Hall is, it is just a facade. You get on the train here, below grade on a dark platform. Even if the platform lacks the impressiveness of the station, boarding here is a real experience. There is a special lounge for sleeping car passengers and boarding is almost stress free, especially compared to air travel. A station like this prepares you for the grand voyage ahead filled with purple mountain majesties and amber waves of grain. A pretty good way to start the journey of a lifetime. 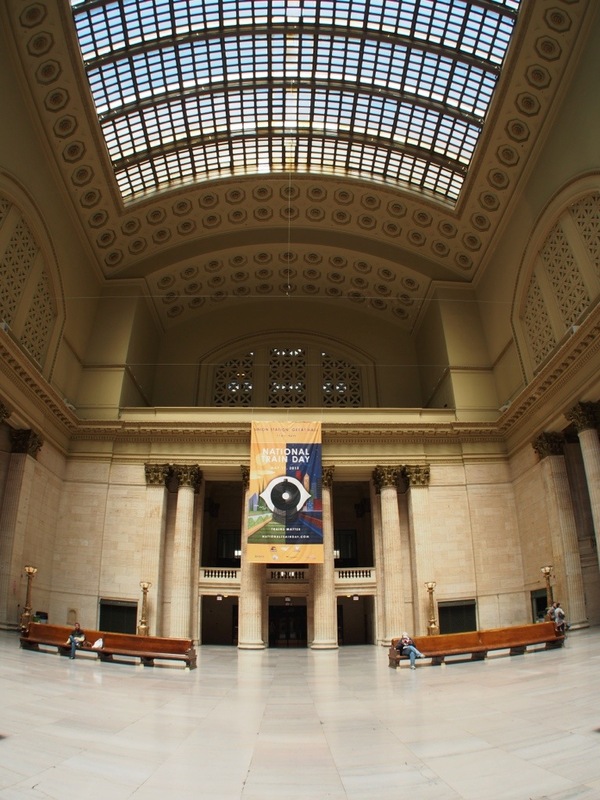 This entry was posted in Photography, Trains, Travel and tagged Amtrak, architecture, Chicago, Olympus, Olympus E-M5, photography, The Empire Builder, Union Station Chicago by artsifrtsy. Bookmark the permalink. Loved the details on this post! Thanks, there were so many to choose from. I love exploring a new place. I want to take that trip in reverse in October, and go from Portland to Indiana. Did you get off anywhere in between your start and finish? We didn’t get off, but we met a couple from Seattle that got off at Whitefish and spent 2 days in Glacier Park and caught the train home. I thought that sounded like a great plan for a long weekend. So far we have just made through trips, and it’s nice to have the same staff on a long trip. 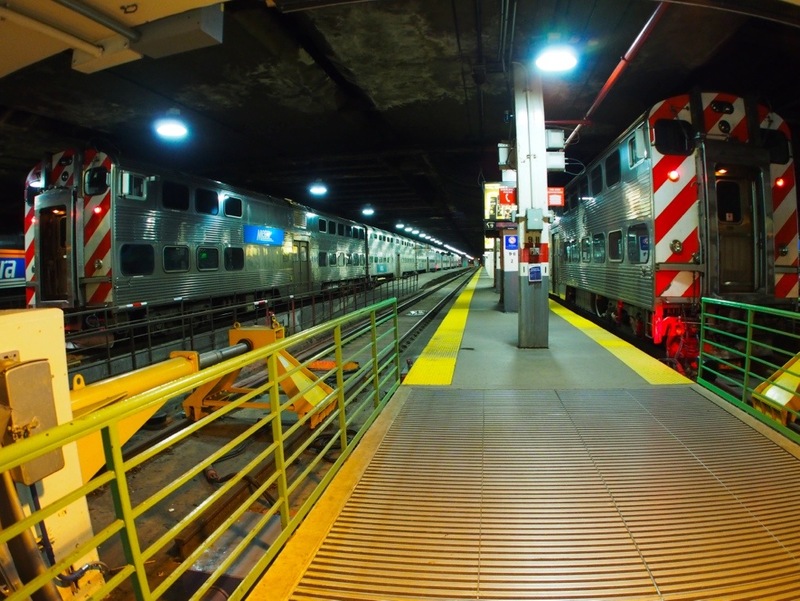 Depending on where in Indiana you should be able to catch the Shore Line in Chicago at this station. What a trip! Loving the pics! Thanks – it was a great ride. Have you been on a train lately? Not since October…..and it is calling! It’s like getting a tat….ya just can’t get enough! Sounds like a fantastic experience. In this age of fast planes getting a person from A to B in the quickest time, it’s nice to read of the old fashioned way where you take the time to view the landscape and enjoy the ride. Love the details in your photos, especially those worn marble steps – they actually look rather dangerous with their worn curves and dips. That’s really what train travel is all about. My sister and I call it “the movie” we look out our picture window and watch Minnesota pass by. There is a special pace to train travel. Those stairs were very uncomfortable to walk up near the rails – I walked up the centers of the tread where the wear is less. Wow it’s unbelievable how worn the stairs are! 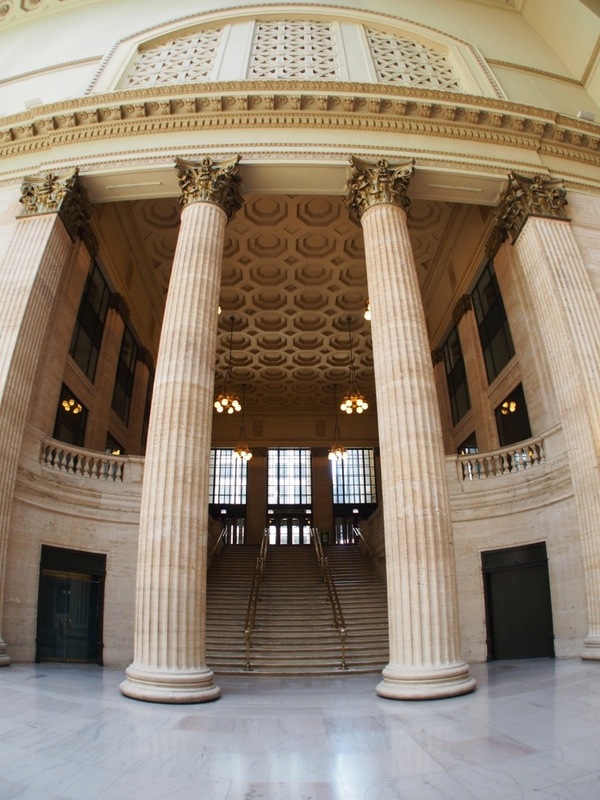 What a grand looking station indeed. I was watching a Canadian talk show this morning and a designer used this station as inspiration to design an interview room in Regina where Canadian artists were interviewed in regards to their music during a Canadian Music award show whose name escapes me at the moment. Wow, talk about a run-on sentence! LOL – sometimes you just gotta get in all in there 🙂 The details in this place were amazing and the ceiling was unbelievable. There is an odd LED monitor in the center though – progress. One day I’ll make my way there and see it for myself! Wonderful! I grew up going into NY City on weekends through Grand Central Station. Similarly beautiful with those incredible details. That’s a station I am dying to see. 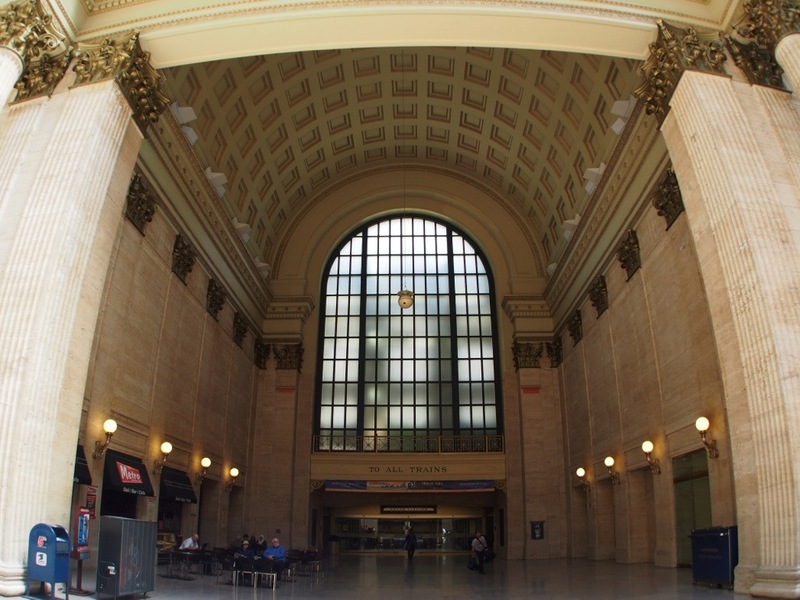 Chicago is now more of a grand waiting room since the actual functional station is now underground. I haven’t been in Grand Central Station in over 30 years. It was renewed in the late 70s and it’s happening again now. I guess I need to go back! A few years ago I was visiting my brother in Chicago and I picked our mom up from Union Station (she came to meet us from out-of-state). I was blown away by how cavernous it was in there! Nice pictures, Lorrie. I’m glad you had such a great trip! It really is an amazing place – they use it for special events these days too. It was a great trip – it’s good to get away once a year if you can and just let life happen. Wonderful photos, Lorrie. I like the detail you caught on the marble stair treads. One question, who polishes all that brass? Union Station was the very first place I saw on my first trip to Chicago. I’ll never forget it. These are great shots! I love that place. Last year we boarded in Emoryville CA – a bit of a bus station, and got off in Denver where the station was being rebuilt – they dropped us on a street corner. Chicago was sublime. Portland was pretty cool too, but I was too exhausted to take many photos. Lovely photos! Really show off the beautiful architecture.